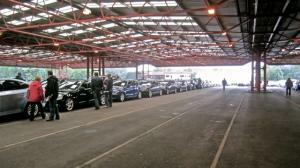 British Car Auctions (BCA) is set to develop a 20-acre facility in Birmingham’s Perry Barr, due for completion in 2015. Planning permission has been put forward for the site, which will house de-fleet, inspection, appraisal, preparation, refurbishment and logistic services and is expected to create around 200 jobs. It will be located between junctions six and seven of the M6, and will be able to house 600 vehicles up for auction, including cars and light commercial vehicles. The quantity and variety of the vehicles on site gives rise to the need for a combined motor trade insurance policy. This will ensure all vehicles and equipment stored at the auction house, as well as the auction halls and undercover areas, will be included under the policy. BCA managing director Spencer Lock said: “As the new and used vehicle market expands, we are committed to investing for growth meeting our customers’ needs through continuous development of our remarketing services. Customer parking for 400 cars will be available, and the centre will also encompass a café, training facilities, business suites, and buyer services such as digital bidding facilities. The 200 jobs created at the site range from technical, operational and administrative staff, to inspectors and vehicle preparation positions. The facility in the West Midlands is estimated to take 12 months to complete, with the company projecting a 2015 completion date.